A critically-acclaimed collection of songs at the intersection of high art and accessibility. Geoffrey is a Midwestern singer-songwriter currently based in Nashville. Inspired in part by: Gregory Alan Isakov, Elliott Smith and Ryan Adams - he presents his own compelling and artistic brand of indie/pop/atmospheric folk music. Since 2004 - Geoffrey is the definition of a hardworking 'indie' artist - recording and performing across the United States while acting as his own manager, booking agent, and publicist. In that time he's built his name with full touring schedules and captivating live performances. In January of 2013 - he booked himself a tour to The Inauguration in Washington, D.C. and back. In July he recorded a new CD in-between Midwest and Southeast Summer tours. A Kickstarter campaign to fund the official studio recording is in the planning stages. 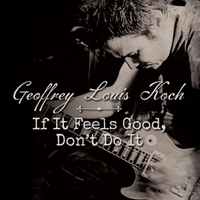 In December, he repackaged and reissued his last studio album with Wilco's Ken Coomer, 'If It Feels Good, Don't Do It' which is also available on iTunes. While living in St. Louis, Geoffrey was a featured musician in the documentary series The Chevy Music Showcase. In 2012 the videos they produced created a fresh wave of exposure and momentum for him, via his episodes airing on the local CBS affiliate and their presence on YouTube. Geoffrey performed 'Chasing After You,' showcasing the range and emotional depths he has become known for. At the end of 2012, he won a new Chevy Express tour van courtesy of The Mid America Chevy Dealers involved with the production of The Chevy Music Showcase. He took that van for a spin across the country on a January 2013 tour to the Inauguration, providing fun 'tour life' social media updates at chevymusicshowcase.com. I love how ambitious this record is. Geoffrey goes full rock in one and just him and guitar in another, and they all slay me. Great work, Geoffrey!